Traveling from Buenos Aires to Mexico, “The Whole World a Bauhaus” exhibit has made its way to Elmhurst, Illinois; it is only U.S. stop. The exhibit, which was curated by Boris Friedewal, celebrates the 100th anniversary of the founding of an arts and design school in Germany, the Staatliches Bauhaus, or popularly known as just “Bauhaus”. 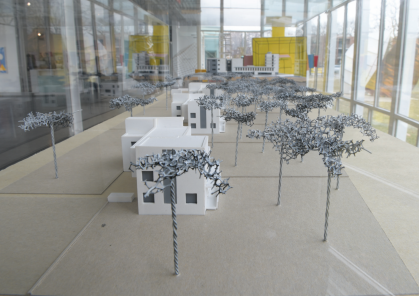 The display showcases the talents of students and faculty of Bauhaus as they experiment with modern architectural styles and avant-garde material-based exhibitions. Fourteen years after their founding in 1919, they were shut down by the Nazi Party. The importance of its presence is not lost on Elmhurst Art Museum executive director, John McKinnon. The Elmhurst Art Museum knows personally of its influence. Known as one of the greatest architects of the 20th century and the last director of the Bauhaus school, Miles van der Rohe designed the McCormick House in 1952, one of only three single-family homes he built in the U.S. The McCormick House sits adjacent to the Elmhurst Art Museum and, according to their website, houses its own exhibit focusing on the history of architectural experimentation and design influenced by Rohe and his contemporaries. McKinnon talked about the honor of showcasing the exhibit with the local connection of the McCormick House. “[It is a] great way to connect the international anniversary with something very local and part of our organizations legacy,” he said. McKinnon encourages students to visit and experience the exhibit. The exhibition runs from until April 20 with free admission to Elmhurst College students and teachers.